The Life of Timon of Athens. By William Shakespeare and Thomas Middleton (The Oxford Shakespeare). Ed. John Jowett. Like Gary Taylors and Roger Warrens reconstructed text of Pericles, this new Oxford edition of Timon of Athens follows in essentials the conviction laid down in the complete Oxford Shakespeare of 1986 and the Textual Companion as to the shared authorship. 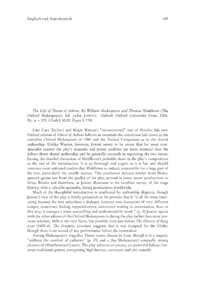 Unlike Warren, however, Jowett seems to be aware that for most nonspecialist readers the plays dramatic and poetic qualities are more essential than the debate about shared authorship and he generally succeeds in separating the two issues, leaving the detailed discussion of Middletons probable share in the plays composition to the end of the introduction.